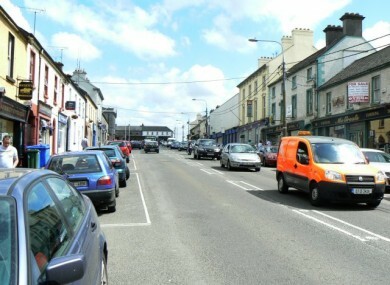 Almost one-third of commercial property is lying unused in Edenderry, County Offaly. EDENDERRY IN OFFALY has the highest vacancy rate for commercial properties of any town across Ireland, a new study has shown. An analysis of 101 locations, published by Irish buildings database GeoDirectory and DKM Economic Consultants, found that 31% of commercial property in the Offaly town was lying vacant in the fourth quarter of 2016. The study, which examined 79 towns across the four provinces plus 22 Dublin districts, found that Sligo had the highest commercial vacancy rate of any county, at 18%. Leitrim, at 16.4%, Donegal and Mayo, at 15.6% each, and Galway, at 15.4%, rounded out the top five counties with the largest shares of premises lying unoccupied. 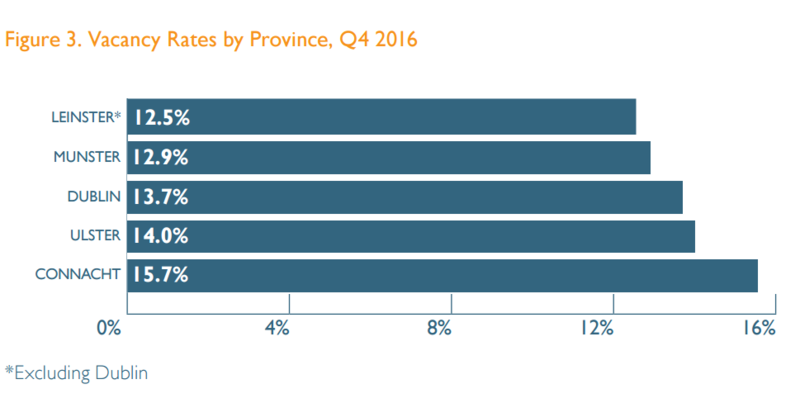 Overall, commercial vacancy rates in Ireland rose from 12.6% in the fourth quarter of 2015 to 13.5% during the same period in 2016. GeoDirectory said that there were 213,666 commercial address points in Ireland, with almost 29,000 of those properties lying vacant. The organisation said that its figures indicated “a substantial unused commercial building stock not just across the country but also in Dublin”. In the last year, commercial vacancy rates increased in 25 out of the 26 counties in the Republic of Ireland. 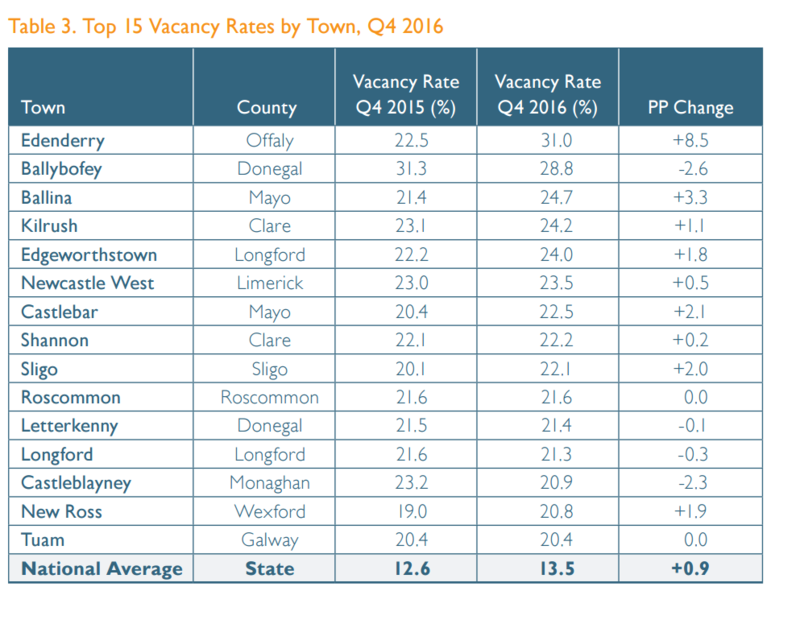 Connacht, at 15.7%, had the highest vacancy rate of any province, while Leinster, excluding Dublin, had a vacancy rate of 12.5%. Limerick was the only county that retained the same vacancy rate as in 2015, however GeoDirectory still described its rate of 15.3% as “notably high”. It was found that there was a split between the east and west of the country, with counties in the west generally reporting higher shares of unused properties. At 24.7%, Ballina in Mayo had the highest vacancy rate of any town surveyed in Connacht. Kilrush in Clare topped the charts in Munster at 24.2%, while Ballybofey in Donegal was the highest recorded in Ulster at 28.8%. According to the report, the 15 towns with the highest vacancy rates “were predominantly located in the midlands or west of Ireland”. “(This indicates) the extent of underutilised commercial capacity outside the main urban centres,” it said. GeoDirectory CEO Dara Keogh said that there is a “growing divide” between the east and west of the country. “The six counties with the highest vacancy rates are on the west coast. Our figures reinforce the theory that we have a recovery that is somewhat skewed with the west of Ireland falling behind the rest of the country,” he said. Annette Hughes of DKM Economic Consultants said that the study “shows the areas most in need of support”. She added: “Despite evidence from property agents which indicates that there is a strong recovery underway in the Dublin commercial property market, commercial vacancy rates across Dublin were mostly in double digits. Email “This town has the highest rate of empty shops and offices in Ireland”. Feedback on “This town has the highest rate of empty shops and offices in Ireland”.